I don’t know about you but the thought of supermarket shopping brings me out in a cold sweat. It’s not that I’m adverse to shopping per se, I’m merely opposed to the ethically devoid multinational food corporations, whose sole motive is profit at the expense of environmental and social justice. Join me as I take a look at the current culture of the supermarket, and explore the challenges they pose, with an emphasis on their environmental impacts. I also share alternative models and suggest ways of minimising our personal impact. When we each take responsibility for our consumer choices, we empower ourselves to be the change we wish to see in the world, and inspire others to follow suit. Whilst shareholder-beholden, profit-driven, monolithic supermarket giants may spare you a penny or two, critics say this comes at a cost. And one that may one day cost us the very planet we live upon. As these grocery-goliaths create a monopoly over the food supply, local shops are driven out of business with town centres emptying. Environmental degradation is common place, species are being plundered into extinction and suppliers complain about ever-shrinking margins. On a personal level, I like to know the food I’m being offered will not harm my health, and that includes knowing where my food comes from. With the plethora of chemical ridden, sugar-laden, processed and Genetically Modified (GM) foods on offer at the local supermarket, how can I trust they have my best interests at heart? This was brought to light by the horse meat scandal, which revealed a worrying lack of public knowledge about where our food comes from and highlighted the baffling inefficiency and complexity of the global food supply chain. Even more concerning is the extortionate level of waste produced by un-recyclable food packaging, which now constitutes to about a third of our municipal solid waste. Supermarkets seem to proliferate a throwaway culture which is trashing our finite resources and polluting the environment. If you’re inclined to buy organic in supermarkets, you’re likely to encounter extra packaging. Due to strict regulations, fresh organic produce is individually wrapped, posing an extra dilemma for the eco-conscious among us! Packaging also comes with safety issues of its own, with the potential for chemicals to leak into the land, entering the food chain and harming animals. “The impact of this plastic waste can be seen littering our landscape, threatening our wildlife and accumulating as ‘plastic soup’ in the Pacific Ocean, (which is roughly the size of Texas),” says Environment Commissioner Janez Potocnik. Much of the waste is caused by the frivolous use of single-use plastic bags. Plastic bags never biodegrade, but they do breakdown. As they do so, any toxic additives they contain—including flame retardants, antimicrobials and plasticizers—will be released into the environment. Plastic bags are especially harmful to marine animals as many of these chemicals may disrupt the endocrine system – leading to a slow and painful death. Many animals confuse the plastic littering the oceans for food, including sea turtles. One in three leatherback sea turtles have plastic in their stomach, most often a plastic bag, based on a study of over 370 autopsies. For sea turtles, the plastic blocks their digestive tract which leads to slow starvation. 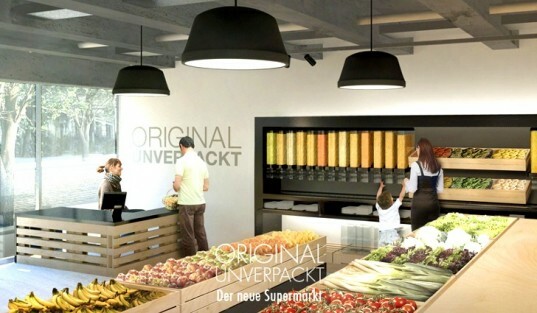 Berlin grocery store, Original Unverpackt, offers a refreshing model for eco-concious consumption. Frustrated by the over-packaging and wastefulness they saw in the retail food industry, friends Sara Wolf and Milena Glimbovski crowdfunded the ethically driven store which opened last summer. They have successfully established a way to economically sell food without contributing to the huge amounts of municipal waste caused by food packaging. They sell mostly organic products dispensed from refillable containers, so the store creates zero waste and the customer is able to purchase exactly as much as he or she needs, which contributes to less waste at home. If nothing else, the shop presents a thought provoking model for consumption, which if it catches on, would provide considerable environmental benefits across the globe. I sincerely hope this will inspire supermarkets of the future as more and more people are realising the need for sustainable living. Food for thought…literally!!! Many governments are wising up to the need to ban plastic bags with countries such as Italy and France among others imposing a complete ban on all single-use plastic bags that are not biodegradable and compostable. Until the ban spreads worldwide, we can opt for reusable bags instead. It always shocks me to see so few people using reusable bags, when the dangers are glaringly obvious. For me the answer lies in educating the general public by raising awareness to the necessity of doing so, and inspiring others through example. Instead of shopping at big supermarket chains, try your local eco-shop, or farmers market instead (find your nearest one at www.farmersmarkets.net). You will reap the benefits from chemical-free food, less waste, reduction in food miles and CO2 emissions. Many eco-stores and markets also offer refillable bottles for an array of products. I absolutely love shopping at these places, my conscience remains clear knowing I am supporting an ethical company, and am minimising my personal impact. If we each make consumer choices based on our principles, over short-term economic gain, we can overcome the ‘I’m alright Jack’ attitude and consider long-term benefits to our planet and our future instead. The general critique of eco-shops and farmers markets such as Wholefoods is that they tend to appeal to shoppers who can afford to pay for principles. Whilst I do agree on some level, I also realise why. Ecological farming methods such as Organic, and the manufacturing of independent goods will cost more in contrast to mass-produced, conventional foods. You can read why here. Unless you’re living on the bread line, most of us can afford to eat better quality produce, but it will depends on your priorities. I personally choose buying good quality food over a new pair of shoes, the latest phone or having my nails done for example. I see my health as my biggest priority so am prepared to forgo things which others may consider a necessity. I also believe the more people who buy organic and ethically driven goods, the sooner their price will drop. As demand for organic food and products increases, the cost of production and distribution of such goods will decrease. We can all help to create a greener planet by reducing waste, choosing goods that last and recycling those things we can’t reuse or repair. Some great tips and advice can be found at www.recyclenow.com. If we are mindful of the waste produced whilst shopping, we can buy items with less packaging, a longer lifespan or second hand even. Can you buy something that will last longer rather than a disposable item? Rechargeable batteries are cheaper than disposables, and they can be used again and again – and using real crockery and cutlery for your parties instead of disposable ones can make a real difference. Donate what you no longer use to charity, as one mans waste is another person’s treasure. I’ve found some real gems over the years in charity shops including practically new, unused items. From thinking differently about what you buy, to using re-usable items, to and composting at home – there are lots of ways to make a real difference. Greener living is more than an investment in a cleaner, greener future – we can also work together to make a positive impact right now. With a little thought and pre-planning we can all try to reduce our food and packaging waste and find a way of living in harmony with this beautiful planet we call home. Well thought out article. We already practice two and three. Four? Well organic foods are still a bit out of our price range. One is the big problem that bugs me. I complain to HL about this all the time. When we started recycling (which we have to independently contract where we live because the city doesn’t think it’s important) we found we were only putting our regular garage out for pick up at the most twice a month. But the blue can is full constantly. That was a real eye-opener for us. I can’t wait to get to work on my little garden in a month or so. I do a little raised bed / container garden. Our culture is so disconnected from nature. There is a spiritual connection that has been lost. Making wine is fun too. Be Groovy.